January 5, 2012 February 17, 2018 P.O.P. It’s rather tardy of course, but I’d like to take this opportunity to express my appreciation for the late British-born essayist Christopher Hitchens, who left us entirely too soon last month at the age of 62. I didn’t always see eye-to-eye with him, but he was always engaging and stimulating, and quite skilled at ripping away the veil of delusion. He was a bright beacon of reason and sanity in a vast sea of media vacuity. As it happens, I’d only recently read his 2007 bestseller God Is Not Great; How Religion Poisons Everything. It was an eye-opener even to me, after having spent most of my life studying the outrages committed in the name of religion. It details how one country had all but eliminated polio when its religious leaders became convinced that the vaccine was somehow unpleasing to God, and so the disease made a tragic comeback. It chronicles how, when Salman Rushdie was living under the threat of death for being “blasphemous” (i.e., too candid) by extremists of one religion, the clerics of other religions (notably Western Christians), rather than condemn the fundamentalist fanatics, criticized Rushdie for bringing it on himself. It even makes the case that such supposed paragons of progressivism as Gandhi and Martin Luther King, Jr. were in fact fundamentalists who fought progress almost as much as they promoted it. And it offers a rebuttal to the trendy claim that atheism has inspired more bloodshed than religion (a myth we’ll be examining in more detail in the future). 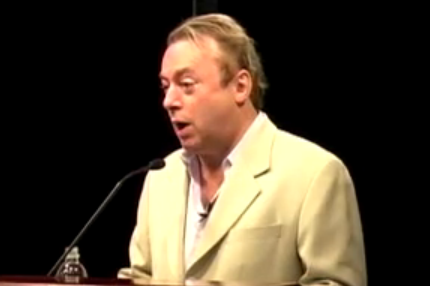 With his biting criticism of organized religion (as well as such diverse public figures as Bill Clinton, Henry Kissinger and Mother Teresa), Hitchens heard from Christians a great deal – usually excoriating him and promising him the penalty of eternal hellfire for the sin of thinking too much. And when it was revealed that he had a terminal case of esophageal cancer (for all his brilliance, he nonetheless indulged in the indefensible stupidity of slow suicide by tobacco), many of them contacted him to gloat over God’s “punishment” of his impiety. (Have you ever known an atheist to talk to people like this?) He responded to this tackiness as he always had, noting that God also doles out such afflictions, and far worse, to the devout – as well as to children too young to understand faith – while many noted skeptics have lived to a ripe old age. SON: Dad, was David right-right, or was he right-wrong? FATHER: He was right-wrong. He did the right thing, it just wasn’t what God wanted him to do. Here was a parent giving his child guidance about how to behave in the world by totally reframing morality to conform to his own religious beliefs. But as grotesque as it sounded coming from him, the thing is it happens all the time. He was merely expressing in balder terms the kind of attitude that religionists exhibit as a matter of course. That’s why it was so refreshing to hear a man like Christoper Hitchens challenge common perceptions about the will of God, focusing instead on what might be called the “won’t of God”. The irony is that if there is a God, and if He is as benevolent as folks suppose, then Hitch probably was following His will as few others ever do. I could not have put that better myself,!! like you I didn’t agree with a lot of his opinions but the man had a way of putting things over to people that had a place for everybody even of differing views. Its a pity he deserted his country when we desperately need such realists and rational thinkers and on balance this is the only thing ( having read all his essays and books) that I ever held against him. C. S. Lewis believed that people who served false gods with pious devotion for noble reasons are actually serving Christ, even if they don’t realize it. So that Christ would still save them and welcome them into Heaven even if they didn’t believe. Lewis might not have included atheists and agnostics in that belief, but I fail to see why. The basic idea behind it is that people who act out of a love for justice and truth, people who honor their commitments because they believe it is the right thing to do, and people who help others out of the goodness of their hearts, are righteous and are serving God, even if they don’t realize it, or don’t want to believe it. Personally, I can’t imagine that Christ would not welcome Hitchens with open arms. I can see Him now saying, “Well done, good and faithful servant,” not just as a sign of appreciation and respect, but also as an affectionate prick of his pomposity. This, like a few other propositions you’ve made, hinges on the assumption that the Jesus narrative is factual; but since there is no way of knowing to what extent, if any, this is the case, it’s impossible to evaluate the accuracy or relevance of such a proposition. Of course, one might say the same about my broader closing statement about Hitch and God. What difference does it make if Christ is real or not as to whether we do right? If Christ doesn’t exist, at least we have the satisfaction of helping our fellow man, which is no mean thing. But if Christ does exist, we will also be rewarded in a way that cannot be matched by anything in life. So, it’s better to do right than do wrong. I just happen to believe that doing so, even if you are a virulent antitheist, makes you righteous and therefore justified to Christ. This is exactly the type of Christianity that I’ve always wished we saw more of out there. Well, of course, as a Christian, I believe Jesus does really exist, that He is the Son of God, and that He sacrificed Himself to redeem all of Mankind. But my point is that, like CS Lewis, I believe Christ is inclusive rather than exclusive with regards to who get into Heaven. In other words, I do not assume Hitchens automatically went to Hell just because he was an antitheist, but rather hope that Christ found him worthy of redemption and welcomed him into Heaven. The relevance is that I can believe that even people like Hitchens are righteous. In fact, that kind of Christianity is far more common than most people realize, because those kinds of Christians are less vocal than the literalist fundamentalists.